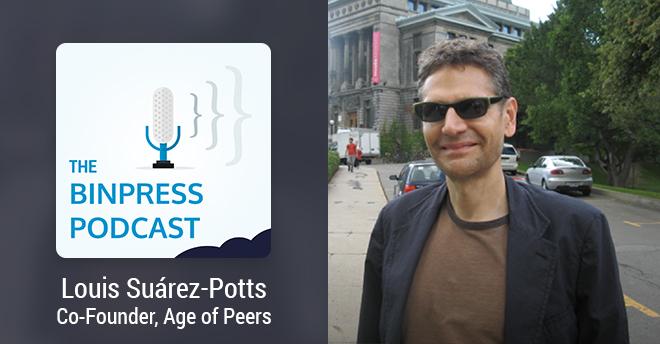 On this episode we talk with Louis Suárez-Potts, Open Source Strategist and Co-Founder of Age of Peers, a marketing, community development and media relations consultancy for organizations involved in open source. He’s also a Project Management Committee member for Apache Open Office. Louis covers how to encourage governments to adopt open source, the importance of balancing agility and focus, and the OpenOffice/LibreOffice split. He also discusses surviving the dot-com bubble, open source communities, and much more. Alexis: Thank you, Louis, for joining us on the podcast. Alexis: I know you’ve had a busy day at a conference. Actually, tell us a little bit about the conference that you’re currently visiting. There’s so many that I think they should be highlighted when they can. Louis: This is actually a pretty important conference, but for all that it has received relatively little attention. It’s a free software and open source conference that’s held annually at Seneca College at York University in Toronto, Canada. Today was an extraordinarily beautiful day, so it was a very lucky day for them. They generally bring in some rather interesting people who are fairly engaged in open source and free software both locally and internationally – that includes the United States. By this I mean that they can be fairly technical, that they’re generally trying to describe in more general terms what it is that they’re doing and what the relevance of open source is to their activities. For example, we have representatives from Twitter; we have people from Mozilla and people from various other large corporations coming, as well as government officials who will speak about the relevance of open source. The interesting thing here is that it’s put on by a relatively small group who have very little funds to work with, actually, knowing in open source we have a lot of funds, in fact, as we know. But they do a really good job, and they make the conference relevant. The problem is that it doesn’t get out – the news of it doesn’t get out very far, and that’s just probably because there are so many competing conferences that are held around this time that it’s really hard for people to focus on one over the other. Alexis: Right. Now before we get into OpenOffice and Age of Peers and your history, tell us a little bit about yourself. Louis: Well, I have what I was thinking at one point in my life an unusual career for a community manager, but as it turns out, it’s not that unusual at all. I grew up in a lot of different places, a lot of different countries and cities, and then found myself finishing a PhD in English at Berkeley and thinking, “Well, I can get a job in North Dakota or South Dakota. Or if I’m really lucky, I might be able to get it in Wyoming or Montana.” These are all fine places I’m sure, but I fell in love, I was getting married; I didn’t have any intention really of leaving the Bay Area in 1999 when this was in dotcom boom. I would be crazy to leave it. And so I started looking around. I’d been long interested in Linux and I was also interested in open source as a theoretical point as well as a practical point – more practical, and this is the truth about open source that’s rather interesting is that it is a profoundly pragmatic approach to doing things and making things and distributing things. It doesn’t really attend to theory; it tends more to practice, so it’s looking at results and it’s looking at how we get those results but without quantifying those methodologies but rather just looking at the results. And I thought that was rather interesting. It also fit in exactly with what I’d been studying for my dissertation. So I was lucky enough after finding one job or another that had nothing at all to do with open source, like in marketing, writing copy, that paid astonishingly well though compared to academic salaries. I was lucky enough to try a job with CollabNet – actually, they recruited me – and I was placed as a content writer or content manager, as I called it, for OpenOffice.org, which was what Sun had established in 1999 and 2000, which is when I was hired by CollabNet. That was months before the boom went to a bust. Sun had grandstanded and inaugurated OpenOffice.org with the expectation of infinite wealth. Their stock plummeted over the next six months – incredibly depressing for the people I was working with – and by the end of 2001, it was worth a fraction of what it had been worth previously, and people had saw their future turned to mud. So they reduced the number of people who were working on Sun’s payroll on OpenOffice from I think 5:1, and CollabNet reduced the number of people its side – because it was under contract with Sun – from roughly that same number to me. Alexis: The last man standing. Louis: Yeah. It wasn’t that the workload changed – it got lighter or anything like that – it’s the opposite. So we had to essentially, well, creatively take advantage of open source. The argument that I had and that I presented, because at this point I’d became the community manager, was that if the community wants to do something, then give them tools to do that. Show them how they can do it; show them that they can do it, and encourage them, make them the owners as much as possible of all aspects of this project. Now the problem was that Sun controlled, effectively — more by de facto than de jure — the development of OpenOffice. It’s much easier now, but it was at the time a very difficult work to code for and work on. The famous point being the commentary was also in German, and the people who had been established to work on it and had been working on it had been working on it for about 10 years – they knew each other intimately. And so it was difficult to bring in people from outside, and also there were very few documents and instructions, and there wasn’t really initially the attitude that we should have that. Nowadays, we don’t really have that perception, I think. I mean, a lot of people might believe it but the general emotion is that what is valuable is the contribution you make, whatever you do. But then this was 15 years ago, 14 years ago, the idea was that it would be wrong in some ways to equate contributors who just do, for example, localization, translations, support documentation with a developer. I said, “No. Let’s encourage the foreign language and remote establishment of ecosystems. Let’s encourage the efforts that people have in their local communities to spread the word. Let’s discourage centralization; let’s discourage notions that you have to start, say, in English and then translate it. Why not go the other way around? Why not, say, you have a module that starts – or a documentation that starts in Tamil or something like that and guests translate it to English or not if there aren’t services for it. This radically decenter things. That worked quite well, and so by five years out, say 2005, 2006, we were probably having – oh I don’t know how many hundreds of millions of people who’ve downloaded it and how many millions or tens of millions were using it regularly, but it was significant. And it was significant enough that we had made a dent in the efforts by Microsoft, which more or less abandoned the clumsy efforts that they had initially adopted to kill us and had taken a more sophisticated approach, which is essentially very special – I should think – of us as competitors to them. We were also working with groups like Sun more formally, and of course our primary sponsor, but IBM as well and others implicitly in the development of the open document format and other things that essentially forced a recognition in the sense of recogitation of what the office suite was about and what it meant to use a file format. When we first started this game, and probably still now I think, people didn’t really know what a file format was especially when applied to, say, in office suite. They just didn’t. Alexis: Here’s a file and it opened. Louis: Yeah, that’s it. They had no conception that there was anything amiss. They were thinking, “Oh, it doesn’t work this time. It looks so crappy. Why?” and so we pointed it out. By hammering this, Microsoft essentially turned. One primary reason was because we got up into the heads of a lot of governments and this took some effort from –. Louis: – Not just me, but a lot of people; that file formats matter, that open standards mattered. You see, the good thing about an open standard, which is what we use with open office, is that you didn’t have to use an open source application. Open standard can be used by any application that implements it, which meant that they didn’t have to confront the scary possibility of dealing with the rabble that’s open source and scary licenses – they could deal with whatever they wanted as long as it implemented in open standard. And that was a great lever. When we did that and started getting successes in enormous countries, Microsoft rushed through famously or infamously its own open standard for its open suite, thus providing the product that would satisfy governments and corporations that were mandated to use an open standard. It’s interesting. Alexis: Now I have a question about logistics. That’s a very subversive move, you know, going to the governments and saying, “Hey, what you need is an open standard” and bypassing hundreds of thousands, millions, of consumers and regular folks out there who will wind up using this thing anyway and going for the giant fish of the government. How did you initiate the conversation with the government and what were some of your talking points for convincing them that this is something you need? Louis: Well it wasn’t just me; it was a collective effort, and not just only I’m part of OpenOffice; I was also a part of many other open source and essentially, quite accurately subversive groups who were trying to wrest from Microsoft being a representative of behemoth software companies – it wasn’t just Microsoft, for example – and try to wrest from them the control of their, or gain some autonomy, wrest from them control of their software systems. For example, one big move was made in Peru since about 2002, 2004 maybe, where people were starting to equate in Peru the software hegemony using those terms to a form of neocolonialism, so the government itself is kind of asserting it. The thing is, you see, the purchasing model for a lot of nations is not consumer-driven, that the government is a large consumer of software. Essentially, the model that you presented in asking that question is kind of like this idea of having a teeming marketplace of consumers, when in fact that wasn’t the case for many of these places. Most of the consumers in those nations didn’t really use software consciously or very actively. Many of them did not have personal computers, for example; the cellphones were of course at the time feature phones, they weren’t smartphones, and so government was by far the biggest consumer. South Africa being a good example here where – and that was one of the richer places in Africa if not the richest place in Africa – the government was heading under the administration then in the mid part of 2000 towards using Star Office, which was the proprietary version of OpenOffice and also OpenOffice. There was no question of consumers at all; it wasn’t that I personally persuaded them. I did that with Portugal and with Brazil and Spain and to some extent Greece and Cyprus and other places like that – also not necessarily successfully. I also did it with, say, Sweden, also not necessarily successfully because other people were also doing it at the same time. I’m probably making this up as a point of example, but it’s pretty hard to argue against that kind of wealth, and so I didn’t. Alexis: Now, I guess packaged in that was a question of terms like logistics. How do you initiate a conversation with a country? Do you go to their –? Louis: I cultivate friends, to begin with. In the case of Portugal, for example, a colleague of mine who was also at the time a Sun employee did have contacts in the government. This is actually the nature of – and among the great things about enormously huge companies like Oracle or even Sun is that they have the ear of the government, and this is just as true in the United States, of course. Working with a large corporation is extraordinarily useful, or helpful, but even besides that, going to conference that are important, where you can then leverage whatever meetings you have so as to reach out to government officials is another thing, and also being probably fearless helps. For example in Brazil, the first time I went down to Brazil, I learned Portuguese for the trip and promptly forgot it. I learned it fast enough so that I could speak it clearly enough to walk up to the ministers who were attending this conference and basically ask to be introduced by people who knew them vaguely and kind of manage a conversation in Portuguese with them and get them then to start attending to what we were saying in OpenOffice and get them to realize that we are very serious about working with them to roll out OpenOffice widely, which they ended up doing. So I think fearless helps – not worrying about oneself, but rather emphasizing the advantage to them of this. And again, you got to find where to go at the right time and whom to know and then press that point. Alexis: Alright. Now you’re still, I guess, in the part of the chronicle of OpenOffice that we’re in. We’re still on at the OpenOffice versus LibreOffice split. Can you guide us through that? Louis: Oh yeah, although almost anything I’d say would doubtlessly be contentious and targeted against them, but essentially what happened is that – and I think they had excellent reasons for believing this – one of the biggest problems with a monolithic project like OpenOffice, and it could be said of almost any monolithic project, that is funded by one huge company is that it’s subject to the market in a way that’s very scary for open source developers. This is where we get to the point of the virtues of open source is that it’s not exactly independent of the market – not by any means. But it removes itself from a kind of weakness so that no one company, ideally, if it fails, is going to bring down an open source project, partly because the license is there and it means that it’ll be hanging around whenever you want. And also just ideally, because the nature of the collaboration is that the risk is distributed, so to speak, so that if one big company falls, well, maybe another one will plug it in or take up that slap. That probably doesn’t really happen in reality. I can think of examples when it doesn’t, and in fact, if you look at the number of open source projects that are created, 99% of them probably just disappear out of the boredom of everyone else, or just because we’re not doing the right thing the right way. But be that as it may, for something as important as OpenOffice, the perception was, “Okay so if Oracle loses interest after they acquired Sun, where are we?” Most of developers were Oracle developers; most of the QA people were still Oracle people, and there was no sense that Oracle was doing anything at the time from the perception of people who formed LibreOffice to ameliorate that and to mitigate whatever anxieties people had. In fact, I think they’ve probably over-exaggerated this, of course, but there wasn’t a perception – there wasn’t the satisfying perception, so to speak, or this notion that they had that there was a friendly environment for community development. It’s not clear what Oracle could’ve done exactly that would have been satisfactory, but clearly they didn’t do whatever they wanted, and so they separated. Oddly enough, of course, it was exactly the group that I had created – the native language groups – that formed the LibreOffice cadre and they worked then with Novell people who have an interesting history unto themselves. They formed a resilient community that has been doing great, and more power to them I suppose, but the fact –. Alexis: And I should mention, we interviewed someone from them last week [chuckles]. Louis: Oh, who did you interview? Alexis: Florian – Florian Effenberger. Louis: Florian is a friend. Florian – I like him greatly. I was very sad when he moved in with the LibreOffice group and we were hoping when it first happened – I was in Berlin at the time, actually – that we could form a kind of collaboration, but it just didn’t work out that way. It’s much more difficult now, even though everyone on Apache OpenOffice would probably be absolutely delighted that there were a collaboration if all the pseudo-bad feelings were done away with, because we just don’t see the point of it. When it happened, my perception was, “Okay, what does this look like – divide and conquer?” I mean, isn’t this the best possible outcome for Microsoft – to fragment your primary competitor? And that struck me as being exactly the worst possible thing we could be doing for open source because they kind of had a self-fulfilling prophecy here. If you were concerned about the project dying because Oracle was going away, well this was exactly fulfilling that prophecy. I mean, doing it for yourself. Alexis: In a different way, yeah. Louis: Yeah, so that was then. Now, I’m very little involved with Apache OpenOffice as I’m on the project management committee and the reason for this is because I just think of the desktop and desktop applications as being extremely powerful and possess a momentum that is going to continue for many years, but simply not the future. And it’s not so much that mobile is, as we know it now, is the future but rather that having a mobile approach, which is, say, a cloud-based possibility is I think the way that we’ve been going in, what we – those who have been reading science fiction as a kid – have just been so impatient to reach. Alexis: I ask not to dig a bowl of dirt, but partly for historical context but mostly to ask the following question – because this begins to touch on a community subject that I think would be pretty interesting, which is discontent. When there’s discontent in a community, how do you handle that? Louis: It depends on the nature of the discontent. Sometimes it’s fine for – I mean, many people are really anxious about forks. I’m not. The main argument against a fork is essentially like the engineering anxiety about inefficiency and the desire to be parsimonious in effort. People hate wasting effort, and the fork is basically almost by definition a waste of effort, because you’re duplicating effort. At the same time though, I think that’s kind of wrong in practical terms, and I think Google is a good example of this. They’re perfectly okay with people doing a lot of duplicative effort because at some point somebody will come up with a better way of doing something that kind of vanishes everything else and makes it more interesting. But you only get to that point once you’ve kind of experimented with a whole bunch of false starts, and I think that in the terms of a rupture of a community like this, it’s a different kind of thing. It wasn’t initially as much a fork as just a division of community effort because people just don’t really like what was going on; they just felt the community wasn’t their community any longer and some are sympathetic to that. In which case, if it’s irreconcilable differences, like a divorce, don’t weld people together if they don’t want to be. Alexis: Please leave me the Ferrari. Louis: [Chuckles] Exactly. So in this case, I was actually – I was personally affected by it because my friends, I felt, were divorcing, and I was personally troubled by it. Many of my friends at Sun felt the same way; this is a personal thing. But from a community perspective, it’s – you got to let go. You can’t force people to do things they don’t want. It’s really inefficient that way; it’s much better to kind of encourage development and see how things get done. In this case, the best thing for the people who actually use OpenOffice is just to assure them, it doesn’t really matter whether you use LibreOffice or Apache OpenOffice for what you want; I think what matters for most people is, most large users like corporations and governments, is their support. Is there going to be continual support? Is there going to be somebody who can do the things they want? That’s the question that needs to be answered, and if those answers are yes, then it doesn’t really matter. Alexis: Right. So fast forward quite a few years, now you’re at Age of Peers, right? Alexis: Tell us a little bit about Age of Peers. Louis: It’s – I guess you can call it like a classic but at the same time a modern consultancy that we formed right after I left Oracle in 2011. It took a little bit of time since we had to hash out things and this evolved since then, but all of us who are members of it or who are the primary consultants have experience in open source for many, many years. Most us are in marketing, public relations and press releases – things like that – journalism and in my case, in community management. What we do is that we work with small, but also large, corporations, organizations, governments, in helping them shape their approach to an engagement with open source. For example, if a corporation or even a small startup is creating something and they want to open source it, and they don’t really know how to go about that but they know how to make the license and they have good ideas about developing a community, but they don’t really know or they don’t really have a solid sense of how to do the strategy for marketing and it’s not obvious sometimes. I mean, obviously, you have to get this out there and get people to use it, but how? Do you go to conferences? Of which? Do you set up interviews? Do you have placements of articles? Do you focus on certain things? What might work? Well, there’s no one answer, but from personal experience – and this is where it comes down to having a large rolodex helps. You can suggest journalists, conferences and ways to approach matters. To give an example, Sandro Groganz has done a lot of work in this but Rory Macdonald and I were working briefly with this one – or longer term for him, briefly for me – this startup that was developing a competitor to a very popular, very widely used ecommerce application or ecommerce infrastructure. The issue there was this is better code – it’s clearly a better code from people who just looked at it who knew about this kind of thing and could evaluate it independently. But how do you get people to then start using it? Well, it’s not so much how you can come up with any possible number of how’s and reasons; it’s how you do it effectively. That requires essentially moving into a community space that is at once marketing, outreach and establishing a brand and identity that people can actually want or can identify and then want to work with. That needs – as we discovered or as I’ve discovered pretty quickly – focusing on the personality, for example, of the developer. Not so much making him a benevolent dictator or a charismatic individual, but focusing on the personality – that actually matters. For example, this one group I’m working with, a startup, the lead developer, when he was working with – he just open sourced some element of his code, but when the first person came to him and started working with him, essentially misinterpreted much of what the developer was about and what the developer was saying and doing. The interesting thing there was that it was a classic case in this failure of correctly reading things because he was reading what he wanted to read rather than what the developer was really saying or the lead developer was saying. I could see it coming and I could see it developing as it happen and I let it go a little bit because I thought that best solution here was for them to just talk to each other in person, and that worked. For people to get any sense of the personality at stake here, what was really meant by some things, is not so much the email is so easy to misread; it’s just sometimes it’s easy to put into words things we don’t really want to put in. When we speak, we are much more effective, I think, in representing our personalities. That can actually affect how we read the code, for example, even if it’s something as dry as computer code. That worked pretty well and that also kind of established or gave a sense of how to establish community there, of how then to go about, say, marketing it that I’m working with him now on doing, so that we can start thinking, “Well, this would actually be a really good place to focus our attentions to get a community built around it. Not this other thing, say – but this other way. To be direct and concrete, this thing that I’m working with started off as a mobile application for iOS and has since morphed into a form of a powerful and interesting browser-based document translator, so another way of putting it — translator’s a bad word, converter, I guess. For example, if you are a CMS – a content management service – or even ERP, you may have a library of millions [chuckles], certainly thousands, of Microsoft documents. Okay, so try editing them using Chrome, or using Safari, or using Firefox. Good luck [chuckles]. If you have Google Docs, you can have them online and you can even have a pretty good collaboration on those; people might complain but they’re going to complain about anything. But if you’re not using Google Docs, and if you’re not using something like Apple iWork, which I’m not sure how good their online editing is –. Alexis: It’s kind of a little better [chuckles]. Louis: Yeah. You will have a whole bunch of Microsoft documents – it’s fine to see them, but then you have to have this on your computer before you can edit then you’d have to upload it back to the web, and then you have to share it that way. It can be kind of clumsy; it’s a hassle. It can be done; we’ve been doing it and we got used to it, but there are better ways to doing it especially if people are using various lightweight tools. For example, if I’m using an iPad or Android tablet or something like that, I may not want – I may not even have editing capabilities like that built into it. A browser on the other hand – and I don’t just mean something like rollApp or something that basically virtualizes the environment, but a browser environment would allow you to edit. For example, there’s a group in Germany, XAMPP I think it’s called, that would provide some of that functionality but essentially working with the service that they have remotely and is kind of clumsy, but it works well enough at that point. So in this case, the application that we’re working on will provide almost a seamless browser-based editing capability for many documents – many kinds of documents: Microsoft documents, .docx especially at first, but they’re gone to ODF. The application would be not just for people working at corporations and government offices, but also education, which is the main thing I want to focus on. I mean, for the last five, ten years – I can’t remember how long – I’ve been very acutely aware that we have far too many children relative to the number of teachers we have. Never before in humanity, I like pointing out, has there been so many children without teachers, let along schools, let alone all the infrastructure that makes education possible in many places. It’s not so much that anyone should be given a computer; I don’t think that’s reasonable, and I think that’d just be a huge amount of landfill, which One Laptop Per Child really never really bothered to investigate. But anyway, I think that people should have villages, for example, or large classrooms where they have access to the web and are able to use something that can actually last a pretty long time. Things that last a pretty long time tend to be something like a tablet. Alexis: Yeah, and a browser, yeah? Louis: Yeah, and then they built it straight online without having massive need of infrastructure. Because, come on, we’ve – I mean, just reading latest reports on what’s happening in Africa and what’s anticipated to happen in Africa is that they’re leapfrogging certain infrastructural requirements; they leapfrogged that proper requirement. It used to be thought that the infrastructure demanded the proper – what we know that passes. Louis: Exactly, and even that’s going to be leapfrogged, and they’re leapfrogging other things. For example, people are moving almost directly to tablets and wireless modalities, so work with that. Don’t just pretend that they had to do some desktop things. Work with what they were going to be going in the direction of, not forcing them in the other direction. More of the point being, work with what the markets are in those localities want, because that’s basically the reality that you have to deal with; it’s not an imposed reality that’s going to work. Louis: Instant gratification or instant satisfaction, where there’s a developer or and user. To elaborate a little bit longer is that if I go to a website, I don’t want to read about what I have to do to do what I want; I just want to do it. The modern answer to that would be, if I want to contribute to something there should be a big, red button or something along those lines. Louis: Yeah. This is what we want. Anything that kind of delays that imposes an enthusiasm-killing, paragraphic text or something like that is deadly. What we want to do then is if someone starts contributing, immediately respond to that contribution, 24 hours maximum. Maybe 48 hours when you’re outside. But respond and kind of say – make it clear to the person who’s contributing, “Hey, this is valuable!” You may dislike the person who contributed, you may disagree with it, you may think it’s absolutely wrong, but it’s valuable that the person has contributed because the person has expressed an interest to essentially donate meaningful and important, mainly his/her time, and that’s incredibly rare. I mean, people have actually – humans, as a general anthropological rule, actually like contributing to other people, other societies that they’re part of, but they only really do it and they really like it most when they have a sense that their contributions are respected and actually liked and actually appreciated. If they feel that they’re raising their voices, raising their hands and offering something but no one really wants it or cares for it, then you essentially just rejected them. And that’s a deadly thing for any kind of open source community that almost every community manager recognizes but we never do it as well as we ought to. That’s true for me as anyone else, because there’s always something that we ought to put in place first, when in fact, that’s not true. I think that it should always be making it easy for people to contribute and then to reply to any contribution. As then as things get more developed, you can kind of add more sophistication here so that it can be somewhat like Open Stack, which I think has a good contribution policy and protocol. You can develop that further, but initially, you respond quickly. Alexis: One of the benefits of open source is that you can have – your users drive what features you implement to a certain extent, but in some cases, it’s better to say no to certain things either a) it’s not feasible because the person managing the project doesn’t have enough time or it doesn’t fit with the ethos of that particular product or they decided to do something a different way. How do you help people decide when to say no to certain features and certain directions and then how do you help them break that – how do you advise them to break that news to the community, or that one rogue contributor who really, really wants x or y feature? Louis: That’s actually a really difficult point – an extremely difficult point – so it’s a case by case basis. A recent example that actually happens all the time in Apache OpenOffice, a recent one happened where a developer was contributing some mighty good ideas, but they’re orthogonal to what the project wanted, because the project had certain ideas, notions of how things should be contributed and what people should do first. Alexis: The world view, right. If someone says, “Screw you guys, I’m just going to go away,” that’s fine. That’s unfortunate, but you got to live with that. Essentially, it’s some projects that had been around a long time that have a very difficult code base have a huge momentum, and they can’t just immediately stop. Getting back to Apache OpenOffice is a good example; Mozilla also comes to mind. It would be really hard to completely move things away from a certain path simply because so much has been done on that code base, and it has therefore such a fast momentum. A better solution might just be to start it fresh elsewhere. Alexis: Now in your 14, 14-ish+ years of working with open source communities, what’s the hardest thing that you’ve faced? It doesn’t have to be necessarily a single occasion. I guess I’m looking for a pattern here. What’s the thing that you consistently face that’s pretty tough when dealing with communities? Louis: That’s a good question, actually. Most communities tend to be different; they also – it’s like Tolstoy argument here. They are different and they’re miserable in their own separate ways that really, it’s –. I almost want to say that there isn’t really a coherent pattern. I think that personality issues often come up. Understanding oneself and one’s effects on community is perhaps the most interesting part here, because you try to think of yourself as being essentially a neutral element with someone who is essentially just trying to be rational at every point. Louis: Yeah, you may be, but that’s certainly not the impression that other people might have of me. Understanding that is useful and difficult at the same time because it’s always the case when one wants to be defensive, but the other part might just be that some people in the community, they just want to do what they want to do regardless whatever great ideas I might have and I just have to live with that. If they want to cut off their nose to spite their faces, okay, I can’t say anything necessarily to stop them from doing that, so one just has to live with that. What I found though is that as almost all communities mature after, say, a few years and after having many, many people join them and contribute to them, they do tend to come across the same points again and again that we all have. And so the other thing that perhaps is most difficult is biting my tongue and thinking, “Okay, I have to go through this many times.” Because I’d just sound like a grumpy old guy if I start saying all those things and –. Louis: Yeah, I mean, you just bite your tongue and think, “Okay, these people have to learn it themselves” and they do – that’s the incredible thing about it; they really do. If you could tell them, they just won’t hear you. They’ll nod their head and listen and so forth and pretend that they’ve actually understood what you said, but then lo and behold, they do exactly what they should not be doing. So you just bite your tongue and just get patient. Alexis: What’s one mistake that you’d rather not repeat? Louis: It’s something that I think everyone has realized and that basically the lean startup kind of captures it, although the fact that everyone buzzes about that book makes me really want to hate it. It’s kind of true in a sense that you should be as agile as possible, and if you’re not agile and able to pivot as you call it, then you’re dead. But at the same time, the counterargument’s you have to be absolutely focused – you cannot be distracted. Being distracted under the impression that you’re being agile and pivoting is a death sentence, so you really, really have to be focused on what you’re doing, and that means you have to force yourself to do things that you just really don’t want to do like finding yet another business plan or a marketing plan that you think is just utter nonsense. But you try to make it coherent and real and you try to actually make it so that people can get what you’re saying, and that is verifiable; it’s not just nonsense. You try to put some truth into it, and that’s incredibly difficult. It requires a lot of focus; it requires a lot of energy and it requires also the growth, you think after a while, “This isn’t really working; maybe I’ll have to change” and then change. But when you’re doing that one thing, you really have to be focused; you really have to be disciplined. Everyone wishes they could be able to be disciplined at that level more often, but it’s hard. Louis: Internationally, the decentralization of OpenOffice and decentralization as much as possible of other projects so that there isn’t a privilege of American, Anglophone culture or of Silicon Valley, that it is in fact an open source that people can claim as their own and to live with that and then to go with that. Alexis: So what’s the best way for open source to sustain itself? I’m speaking particularly in terms of financially. Louis: The classic way is services, add-ons – things like that work pretty well. They don’t work when people don’t really have good services or add-ons, I think. It’s not that the model doesn’t work; it’s that their products don’t work. I think that the initial period is most difficult, and it’s actually the one that I had the most difficulty with in persuading startup founders that they should open source basically the entire IP of their company. I don’t have compelling arguments simply because in most cases it does not make a compelling argument — or make for one — it’s just not the best argument you can make. But in some cases, it is a very good argument for open sourcing some crucial elements when it becomes a way by which the developers are able to get collaborators. In the case of this one company that I’m an equity owner of – UX Productivity, which we’re changing the name at some point – we open sourced a crucial part of the application, the converter library, that allowed documents to be converted from one format to another and place it on GitHub and made an Apache version to license so it was very open indeed. Louis: Yeah, essentially very gently persuasion; basically saying that this is the logical path to follow simply because it’s a resource-rich path to follow. Open source can provide enormous benefit because of the collaboration. It provides a risk, but that risk is worse if you haven’t really clearly understood what it is that you have and how to basically sell the value of the product that you have been working on. If you do an open source project poorly without thinking through or kind of impulsively without thinking how you can add value to it regularly, then it can become a problem. In this case, for example, working with CMSs, ERPs or any other organization that is like that, as well as mobile applications, because the key element here that makes it a useful tool is proprietary still, but the part that can be added and expanded upon by the collaborative community, by the open source community, is something that can be included in whatever application people want, and is very open. We’re able to do this because we have a sense of how the project is organized and where value can be added to it, and that’s very hard to come to – extremely difficult, actually, for most applications and for most people. But having that apparatus in persuading people of how to go about it is very difficult, but also worthwhile. It’s not because I’d feel that open source is always going to be better – it’s not. It’s because I think that in many cases, the collaborative environment of open source does lead to better products and does lead to more sustainable effort than having, say, a sole proprietary product that can be erased almost overnight if the market changes dramatically, as it would have been the case here because of, say, Apple’s pivots and because of Apple’s own market encouragements. For example, the latest version of the Apple operating system – Yosemite and 8.1 for iOS – killed thousands of companies and their applications, I’m sure, because it replaced what they had been doing. Likewise, Apple’s making free iWorks killed a lot of small companies and applications. Microsoft’s doing the same thing, making it almost free – the same thing. This happens. This is the nature of business; this is the nature of the market, and so you find ways to mitigate that and to nullify this factor of the market in this fashion. The best way that I can think of anyway is you should be going in the direction of open source. Alexis: You’ve done a lot of thinking about open source – both in the academic and applied sense – so this is a pretty open ended question, but I’m interested in seeing where you’ll take it. What’s the biggest opportunity in open source? Louis: To begin with, I would answer by saying, first, get rid of any kind of constraint of software. Imagine hardware as well, so it’s open hardware. Let’s call it open hardware, open software, and then expand it even further so it can be what we would be calling now the open everything or open access as well. The biggest opportunity from an entrepreneur’s perspective is that you can essentially cobble together really interesting products from the code that is out there without having to buy it yourself. Sometimes, however, it’s so much easier to buy it yourself than to cobble it together because it’s like two visions on somebody else’s papers and you have a whole bunch of them – it’s far easier just to buy it yourself. This is usually the reaction of most developers, and they’re not wrong. But sometimes it’s easier to have an architecture that provides for plugins that can then house a series of different kinds of open source features and expand the functionality of any given kind of idea or product that you might have. Another way of putting it is that one benefit that we have now is that innovation, as we might call it, clever ideas, is in some ways easier now to get or to have and even easier to turn into products people can use. The other thing is that the thing about open source that I particularly like is that you can work with the community that is also the end user community, so that, in some ways – I think that Kickstarter is an example here – is that you can say, “Hey, this is what I’m working on. I need people to test it; I need people – for some of you, you do not like testing and something that’s going to explode in people’s houses or something. But to test out something that I think ought to work and not to prove people, but you certainly bought to test it and you’re certainly welcome to add to it and make it better. If you have enough gumption and enterprise and resources, and if you want to enter into product, okay, I’ll live with that. But this is what I want people to work on; this is the idea that I have; this is where I think things got to be going that ought to be rather interesting, and that kind of relationship with your end user community, with your consumer community, that there’s a way with the commodification isolation effect – I think it’s incredibly powerful, and I think it’s actually one of the few things that what would probably sustain us in the future. When people become more aware that, “Yeah, this is something that I can tinker with, this is something I can improve or not” then you’ve kind of achieved that which open source has been hoping for in many ways, and this is something that I think will occur. Alexis: I think you may have just answered my next question which was even broader, casting off the kind of entrepreneurial spirit of just what’s the future of open source in general. Louis: It depends where it finds its greatest, strongest home. I think that the future really depends ultimately – what it comes down to in the hands of people who have the most quantifying value in it. But I’ll put it this way: it’s always been the case that people who’ve wanted to hack their bodies — I don’t mean cut it up, I mean like hack medicine. People have always wanted to hack their bodies in a literal, unfortunate way. But since the very beginning of time, probably people have taken vitamins or whatever the equivalent was for the cavemen. “Oh my doctor tells me to do this, but I’m just going to ignore it.” It’s become a lot easier now and also a lot more dangerous. So we read routinely about bodybuilders, for example, who have always been body hackers, and I’m using this as an example of what is going to be the kind of future is that, that remains a domain where people have said, “This is really important to me. I don’t really trust, or I can’t really rely upon official dispositions of knowledge and technology. And so I will go with the less official, the undercurrent one, and share what I’ve learned and also other people will share what they’ve learned.” The problem here though is the obvious one: they can’t really trust unnecessarily. But that’s exactly the problem, isn’t it? Open source, in a way, has given people a means by which they can evaluate the effectiveness of something, the trustworthiness of something, by whether it works, whether it does what it claims to do. But if you expand that a little bit and it’s being expanded – not just a little bit, but greatly – evaluating how something works becomes a lot more difficult. For example, with medicine, I mean we have a whole bunch of different techniques and technologies to evaluate whether something works or not, and we see the failure of accurate reportage all the time, even with the Ebola epidemic right now. With the initial reportage of the CMAP, it was wholly inaccurate and misleading because it turned out these people were also given conserved blood and CMAP may have had no effect whatsoever. But that wasn’t revealed at first, and that kind of lack of knowledge, that lack of transparency, I think is an area that open source can speak to because it can start saying, “Okay, the results speak for themselves in some cases, but how do we know what the result is in other cases?” In software, it’s pretty clear usually, but in places outside of software like in medicine, for example, it’s not less clear. There are too many compounding factors to start with, and also the statistical apparatus to understand what cause and effect is is very difficult to acquire. That kind of focus from open source to other aspects of life, I think is actually going to be developed further, and it’s probably one of the futures of open source – the kind of radical transparency of understanding how things work, in a way that kind of allow us to go beyond peer review, for example, to go beyond the constraints of 20th century medicine and systems and architectures and ways of knowledge, to something that is perhaps more direct and ultimately enhance the people who are actually using it most. Alexis: So is there anything that I missed that I should have asked, or is there something you would like to get across to the listeners? Louis: Very briefly, this. If you have a good idea and don’t have the resources to turn it into a business, open source is a strong alternative and a great option, and this is why: it’s much less risky. As simple as that. It costs a lot less money. Alexis: And resources, might I remind people out there, and I’m also reminding myself, also means time [chuckles]. Louis: It means a lot of time – it doesn’t. Most of us do not have time; open source for many is done in the wee hours. The vast majority of developers for open source of course are employed by large companies, but –. He said, “Patenting is a great idea, but a total waste of time if you want to make money out of something. So what if people copy it? You have to have good advertising, you have to reach people directly and you have to go out there and just make the product and sell it – and then make it patented.” And the same thing is kind of true of a lot of open source or a lot of stuff that you create – don’t worry about just patenting it; get a Kickstarter project going, get people interested in it and then do it. Just do it. It’s incredibly fun. It requires very little resources on your part, very little time; if you want to have parts, if you need someone to be making something, think Ali Baba. Basically, there’s a great Planet Money episode on that; I recommend people listen to it. Open source lowers the boundaries, lowers the bar, makes it easy for people to actually do things that are valuable and enjoyable. Alexis: So where can we go to learn more about Age of Peers? Alexis: And if we’d like to find out what conference you’re currently visiting or what you’re having for lunch, where can we find you on Twitter? Louis: @luispo – L-U-I-S-P-O – and oulipax are both me. Alexis: And you can find us @Binpress and myself, @alexissantos. Louis, again, much appreciated for taking time out of your schedule in what I assume has been a long day of walking and schmoozing at the conference [chuckling]. Louis: Well thanks very much, Alexis. I enjoyed this a great deal and I wish you luck! Alexis: Thank you very much, sir!